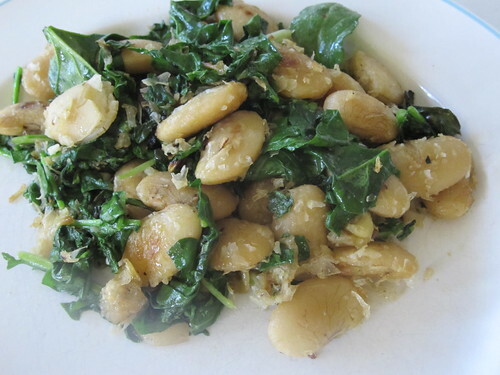 My friend, Lorraine, gave me a recipe for Giant Crusty and Creamy White Beans from Super Natural Cooking by Heidi Swanson, which I immediately lost. Instead of calling her to get the recipe again, I decided to come up with my own version and I am so glad I did. If I hadn’t have, I wouldn’t have come to the conclusion that super large beans are super versatile. 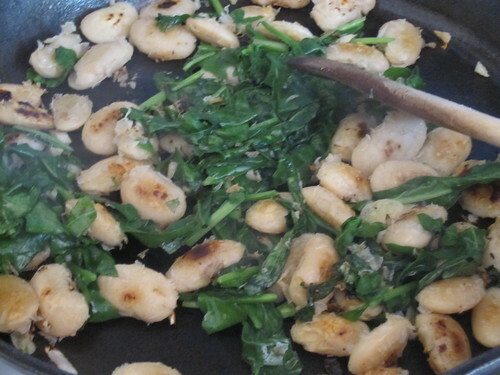 Once the beans are cooked, you can use them as a base for any simple meal. 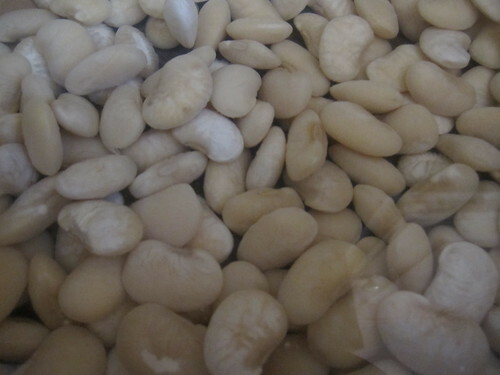 Greeks use giant beans (gigantes) in many recipes and typically bake the cooked beans in a tomato-based sauce. You can also toss them with pesto or bruschetta for a delicious and nutritious gluten free alternative to pasta. Or simply warm a bowl of them, drizzle a little olive oil on top, and toss them with chopped garlic, lemon, and a grinding of salt and pepper for a lovely lunch or side dish. (I had this for lunch yesterday and it was amazing!) Add a little vinegar and some herbs and serve over greens for a scrumptious salad. Or puree the beans with garlic, oil, and herbs for a dip or spread. The ideas are endless. The Greeks fry their Gigantes after breading them first but I like Heidi Swanson’s method of simply frying them in oil or clarified butter and adding greens and garlic. Here is her original recipe. She also has a variation using kale and walnuts on her blog which is also delicious, but in the end, Larry and I liked my variation best. 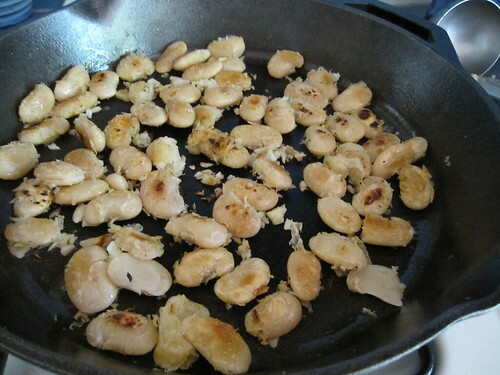 I had a hard time finding large dried white beans (Gigantes or Carona beans are ideal) so I used large lima beans. 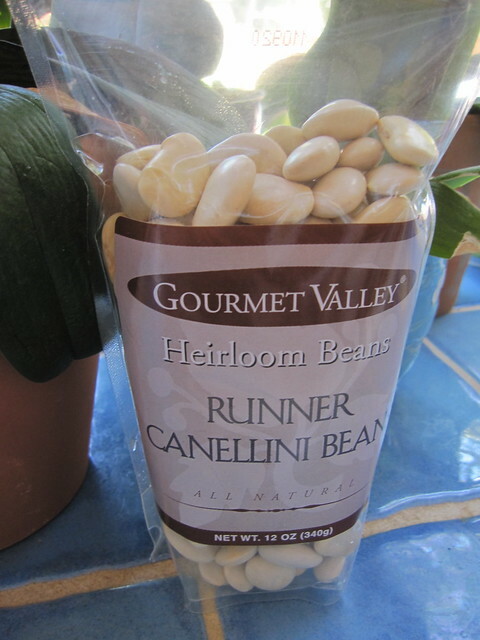 Later I found large runner cannellini beans, too, which had a nuttier flavor and were also delicious. Any large white bean works but the larger the better. The recipe only requires ½ pound of beans, but I cooked a pound of beans and used them for other recipes. Drain, add fresh water, and cook until tender (depending on the bean, anywhere from 1-2 1/2 hours). Drain beans. Heat 2 T oil in a large skillet. 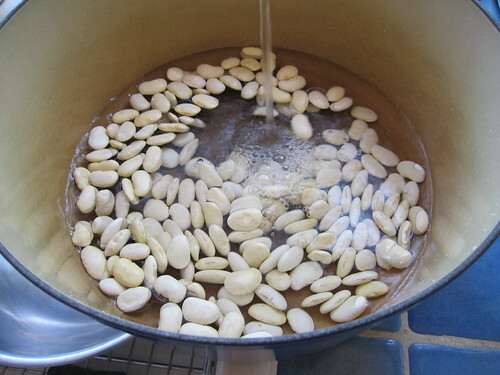 Take several handfuls of beans and toss in 1 T of oil in a bowl. 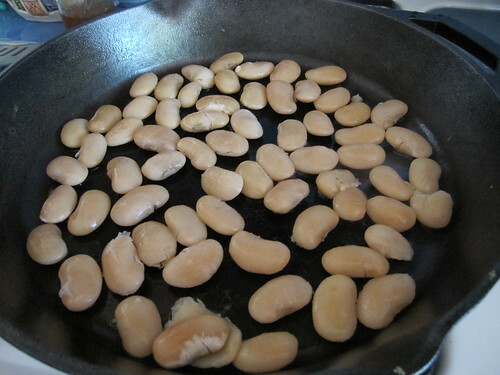 Add beans in a single layer to hot skillet and fry until golden brown on medium high (3-4 minutes). Turn beans and fry on the other side until golden. 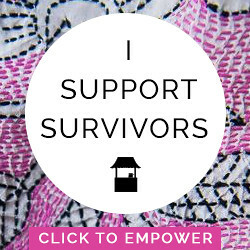 (You can do this in batches.) Add garlic to beans in hot pan and stir for about a minute. Add arugula and stir until just wilted. Toss with lemon, lemon zest, salt and pepper. Drizzle with good quality extra virgin olive oil. Serve! 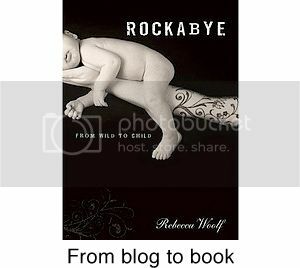 OK, I am DEFINITELY making this! 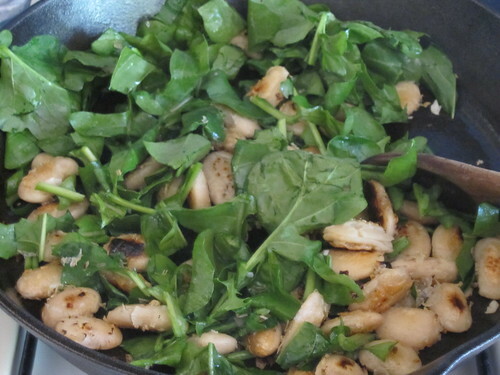 I think white beans are one of the best kept secrets of vegetarians. So versatile and flavorful! I love wilted spinach with olive oil, so I can imagine that this tastes divine. Thanks, WWW! Buying these beans the next time I'm at Whole Foods! Yum! This is something I'll have to try. I am a bean hater (I only eat string beans. I won't even eat the corn from succotash because it's been hangin' out with lima beans). But now, now I'm considering going vegetarian and apparently I'll have to curb my dislike of these...things. I'm glad to find easy doable recipes like this though, simple things to start this new journey. WWW, do you have leftovers from these posts? 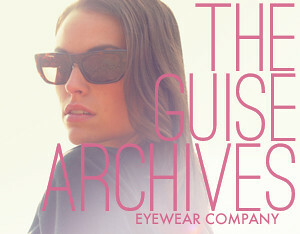 Because I will happily drive down to San Diego and take them off your hands! Yay, something vegan! All the egg and cheese stuff recently has been bumming me out. 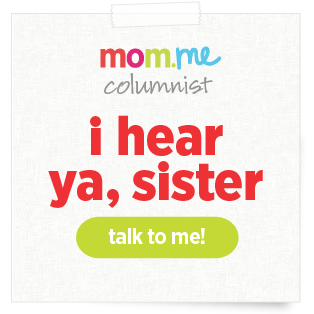 Love your recipes--creative and beautiful too. Thanks for your generosity. This reminds me of my mom who loved these kinds of beans. What a great recipe. Thanks for it! mmmmmmm, add crumbled bacon and it's PERFECT (don't throw rotten fruit).